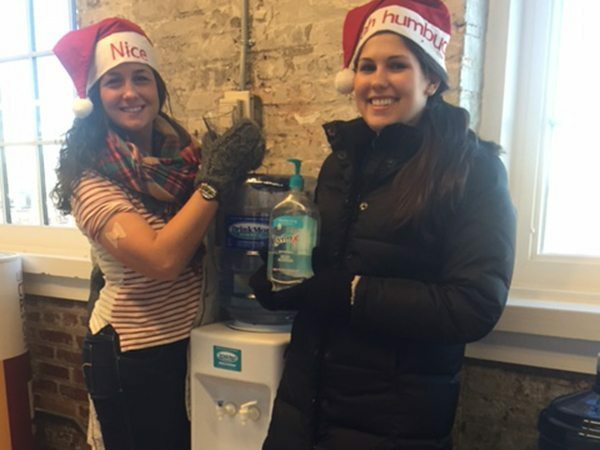 Warm winter clothing – CHECK, flu shots – CHECK, hydrated – CHECK, hand sanitizer – CHECK. Erica J. and Nicole M. our Support Through Sport Program Coordinators are ready for winter! Just this past Tuesday, the National Weather Services reported that temperatures in all 50 U.S. (including Hawaii!) dipped to or below freezing. Much to the chagrin of many, it’s definitely time to break out the winter coat (and hat…and scarf…and winter boots…and gloves). For people living with cancer and in active treatment, bundling up and staying healthy when the temperatures drop is a must. According to American Society of Clinical Oncology, living with cancer elevates the risk for temperature-related illnesses (frostbite and hypothermia). In addition, late fall and winter are peak times for some unwelcome viral visitors, mainly the common cold and flu. Stay Toasty, My Friends – When the temps drop, opt to stay inside as much as possible. If you’re getting some serious cabin fever, make sure you bundle up in layers before venturing out into the cold weather. Some cancers or cancer treatment regimens or medications can interfere with the body’s ability to regulate its temperature. Hypothermia can pop up when the body does not generate enough heat to keep itself nice and warm. In addition, it’s important for those living with cancer to keep skin covered (especially those fingers, toes, nose, and ears) when temps go south. Some people living with cancer who experience nerve issues (like peripheral neuropathy) have an even higher risk of frostbite due to greater risk because this side effect causes them to be less sensitive to temperature extremes. (Flu) Shots, Shots, Shots, Shots! – The Centers for Disease Control and Prevention (CDC) recommends that cancer patients undergoing treatment and cancer survivors receive a flu shot (made up of an inactivated flu virus). Talk to your doctor or nurse about getting a flu shot and the risks/benefits associated with them. People living with cancer are immunosuppressed and per the CDC, should not receive the nasal spray form of the flu vaccine since it’s made up of live flu viruses. Bottoms Up – Drinking water when it’s 100 degrees out is a no-brainer. But what many people don’t know is that hydration is still important when the temperatures dip. Drink lots of fluids in the winter. Dehydration is a common side effect of many cancer treatments. Not being adequately hydrated, combined with having low body fat, can elevate the risk of hypothermia in cold temperatures. Bring On the Hand Sanitizer – As much as we wish it didn’t, the small-but-mighty common cold and flu virus runs rampant in late fall and winter. Keeping up with good hygiene practices is critical. Hands should be washed or sanitized frequently throughout the day – after going to the bathroom, after high fiving a friend, before you eat, etc. Hand Washing 101: Use soap and warm water and scrub your hands for 15 to 20 seconds (about the time it takes to sing “Happy Birthday” or the alphabet song). Rinse them well and dry them with a paper towel. Hand Sanitizer 101: If you don’t have access to soap and water, use a hand sanitizer. Hand sanitizers should contain 60% alcohol to squash those germs. Good hygiene is particularly important for those young moms and dads living with cancer who have school-aged children. Teaching your kids to practice their hand washing skills and proper sneezing tactics (into upper arm vs. hands) and regular cleaning of common spaces (kitchens, bathrooms, door knobs) with appropriate products may help contain germs.